(Nanowerk Spotlight) The drawbacks of existing measures for calibrating scanning probe microscopes (SPMs) based on various diffraction gratings and periodic microstructures, are large period and large error of period. Both factors prevent using these measures for precise calibration of SPMs and other instruments operating in the nanometer range. "Since the calibration measures have an artificial origin, their accuracy is defined by the accuracy of manufacturing," Dr. Rostislav Lapshin, a staff scientist at the Institute of Physical Problems named after F. V. Lukin in Zelenograd, Russian Federation, explains. "Another trend in nanometrology is to use natural objects which calibration size appears naturally. Crystals relate to such objects. To obtain high-quality crystals, we only have to ensure the purity of the raw materials and the appropriate conditions of growth; nature will do the rest. The technical problems associated with the purity of the used substances and maintenance of the necessary growth conditions have mostly been solved at present." Reporting his findings in the December 1, 2015 edition of Applied Surface Science ("Drift-insensitive distributed calibration of probe microscope scanner in nanometer range: Approach description"), Dr. Lapshin has developed a method of calibration of a scanning probe microscope by lattice constant of a crystal. Using the lattice constant as a length standard allows to pass to nature standards in nanometer range abandoning the use of artificially manufactured measures of length. 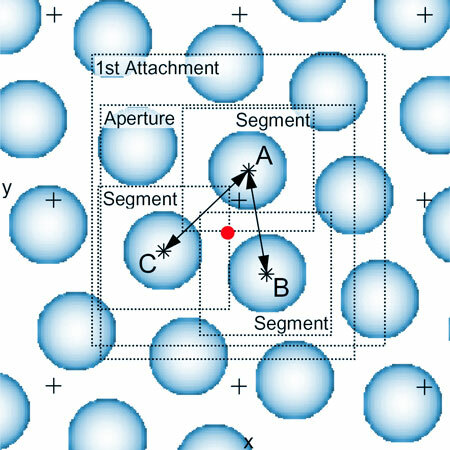 The idea of using the lattice constant of a crystal as a length standard in scanning probe microscopy is not new. However, the practical implementation of such measure has been constrained because the measured distance between neighboring atoms is strongly distorted by thermal drift of the microscope head and by piezoscanner creep. Generally, the smaller the object to be measured is, the stronger is the influence of thermal drift, creep, and noise. The problem of thermal drift can be solved by thermal stabilization of the microscope. However, thermal stabilization requires time for equalization of temperatures of various parts of the instrument, additional equipment, and special rooms. Beside thermal stabilization, it is desirable to cool the microscope to low temperatures (2-20 K) to increase the mechanical stability of the probe. Cryogenic microscopes are very expensive, complicated to operate, require a high vacuum, consume cryogenic fluids, and have a number of functional restrictions. "In our institute" says Dr. Lapshin, "a new approach has been suggested that makes it possible to achieve high precision of measurement of surface topography; it is based on a more complex control of the probe microscope. We termed this new approach feature-oriented scanning (FOS)." He continues: "The main idea of FOS consists in using features of surface topography as reference points during surface measurement or movement. To this purpose, a special real-time function recognizing the surface topography has been built into the scanning algorithm. During FOS, the measurement of a surface is carried out by small fragments known as segments." distortions caused by drift are neutralized by means of a system of hierarchically-organized counter movements. Feature-oriented scanning is adaptive since it is able to change its operation autonomously depending on the state of the current topography and actual conditions of the measurement. "Watching the FOS operate, an analogy that comes to mind is the well-known story of Baron M?nchausen, who pulled himself out of a swamp by the hair (along with his horse)," Dr. Lapshin notes. "Not having any positional sensors, the FOS, during the measurement, ?pulls? the correct image of surface topography out of a ?swamp? of noises and nonlinear distortions. Besides the fact that the FOS allows to obtain a distortion-free image of a surface, it also somewhat improves the resolution limit of the microscope." Unlike the previously used calibration procedures, where the whole scanner of the probe microscope was characterized by only three global calibration coefficients along the X, Y, and Z axes, the proposed method allows to find three local calibration coefficients for each point of the scanner?s movement space. This approach called ?distributed calibration? permits the elimination of all the static errors of the scanner associated with nonlinearity of its operating characteristic, non-orthogonality of its axes, as well as spurious crosstalk couplings between the axes. As drift influence is eliminated during the course of a FOS-based distributed calibration, it becomes possible to conduct an arbitrary large number of repeated measurements; this allows extracting the exact values of crystal lattice constants from noise and thus accurately determining the sought-for local calibration coefficients. As a result, the accurate measurements can be performed without cooling the microscope to low temperatures. In conclusion, the suggested method of distributed calibration allows precise calibration of the scanners of general-purpose probe microscopes by using crystal constant lattices as length measures. At present, general-purpose microscopes make up the majority of inexpensive probe instruments. Their accurate calibration can now be performed at room temperature in non-specialized labs, using the conventional means of acoustic, vibration and thermal isolation. Source: Science and Technology of the Russian Federation (STRF). English translation by Oleg E. Lyapin.